• Print out the bingo card. • Follow our the iPhone OS 3.0 keynote liveblog and take note of the timestamp as the event in the bingo card happens. • You can shout bingo if you fill out one line or, alternatively, one of the four 2 x 2 brick groups. • When you get a bingo, quickly send us an email including the events and their timestamps from our liveblog to tips@gizmodo.com. 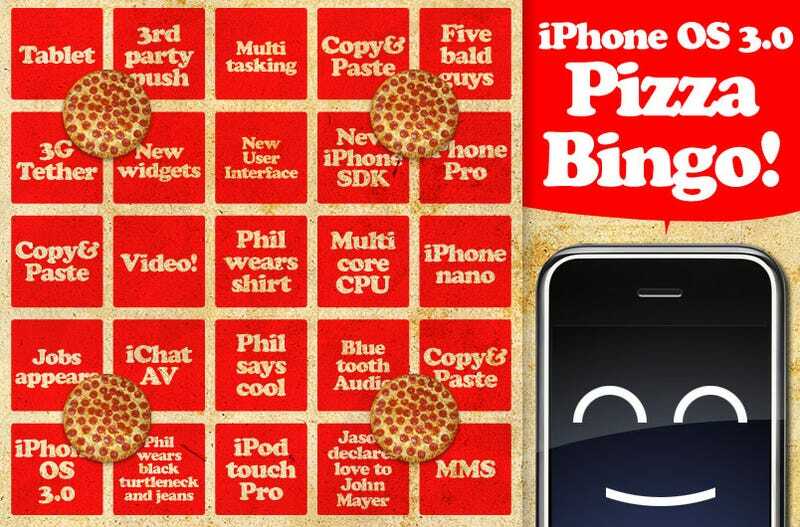 Include "iPhone OS 3.0 Liveblog Pizza Bingo" in the subject, so we can spot your entry easily. The first time we did this, lots of people forgot to put the timestamps from our liveblog. You must put these to participate.